Wendy Shaw will serve on the the National Institutes of Health Scientific Review's Skeletal Biology Development and Disease Study Section. 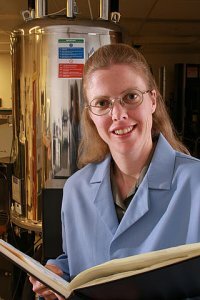 Congratulations to Dr. Wendy Shaw at Pacific Northwest National Laboratory on being invited to join the Skeletal Biology Development and Disease Study Section, Center for Scientific Review, National Institutes of Health. Shaw is a leader in answering vital questions about the formation of biominerals, such as enamel and bone. Her work appears in peer-reviewed journals. Her mentoring and other contributions have garnered a reputation for objectivity, clear judgment, and professionalism. During her 4-year term on the section, Shaw will review National Institutes of Health grant applications. She will make recommendations on the grant submittals to the national advisory board. In addition, she will survey the status of research in the field of biomineralization. Her work and that of the other members will benefit the nation's medical and related research. At PNNL, Shaw leads research projects in two areas: understanding the role of proteins in the formation of natural biominerals, and understanding the role of the protein scaffold in catalytic reactions. Common goals are to understand and mimic nature's superior features for developing materials for practical use. She serves on the Institute for Integrated Catalysis leadership team.